Are You Ready For Another New England Winter? - City Oil Co. Inc.
With the oncoming New England winter season, a person naturally thinks of how to stay warm. This may involve the use of a special type of fuel. What is most important is that, regardless of what type of fuel you use, it be delivered promptly when needed. That is the service you will receive when calling us at City Oil. There are many different fuels that are required to keep businesses, construction and other sites operating smoothly. We are happy to deliver this necessary fuel to any job or industry that requires it to operate efficiently. In our 25 years of operation, we have developed an excellent reputation for our prompt delivery of any fuel that is required with regular delivery or in an emergency. Our expert drivers can quickly hook up and unload fuel in the trucks, or other types of machinery, that must have a special fuel to run efficiently. Whether you are in trucking, farming, manufacturing, construction or any other type of operation that requires fuel, we realize that sometimes it is an emergency situation. In any case, you can be sure that regardless of the weather or type of fuel needed, it will be delivered promptly and on time. Diesel fuel is a requirement on many on-road and off-road situations. Whether it is a construction site or a storage tank in a customer’s yard, for use with tractors and other farm equipment, often, there is an urgent call for the delivery of this fuel. At City Oil, we are well known for our prompt answer for any emergency call as well as our regular delivery schedule. 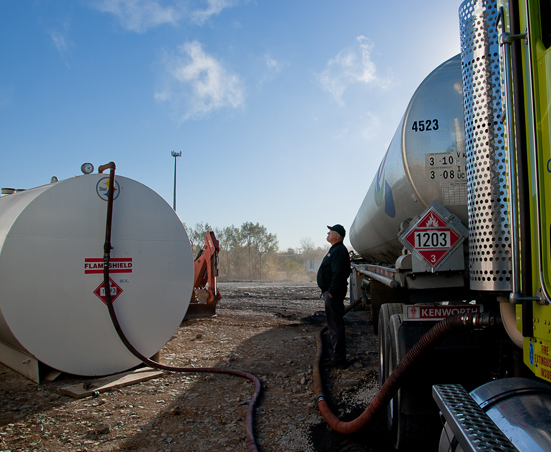 Our commitment is to deliver diesel fuel quickly and efficiently to our many customers. We are proud of the quality gasoline products we provide for our customers. These include Regular 87 Octane, Midgrade 89 Octane and Premium 93 Octane. Our commercial and special delivery is designed to fit our customer’s specific needs. Our modern trucks are able to provide bulk or short load deliveries promptly and efficiently to on or off site locations. When you are looking for quality gasoline products that meet all state and local regulations, we are only a phone call away. Heating oil is in high demand in New England winters. It not only keeps individuals but also business customers warm and comfortable. This makes it important to think ahead and be prepared by filling up your heating oil tanks prior to when the snow starts to fall. We make home and commercial deliveries on a regular basis or on call. Remember, we are only a phone call away when you need this type of oil. At one time kerosene, prior to regular electricity, was used to provide light in homes. Today, in some cases, it is still used for this purpose in addition to being used for heat. When blended with diesel, kerosene prevents the fuel from solidifying. This is extremely important for vehicles working in our cold climate. Protection against the cold New England winters is especially important for fuel users. This makes it important that a fuel additive be added to prevent the motor from becoming sluggish and difficult to start. We, at City Oil Co. Inc. are well aware of how aggravating trying to start a slow moving engine can be. That is why we offer pre-blended fuel additives to our products. One of the most important laws issued in recent years involves the use of DEF. This is a chemical used to reduce vehicle emissions. It must be sprayed into the exhaust of all new diesel engines. Regardless of what your need in fuel oils may be, we, at City Oil Co. Inc. are prepared to offer fast and efficient service to your site. Whether you are a large company or an individual, you will receive the same concerned and efficient service. Call us now at (800) 225-2575, (800) 581-0000 or fill out our online form for more information regarding our services.